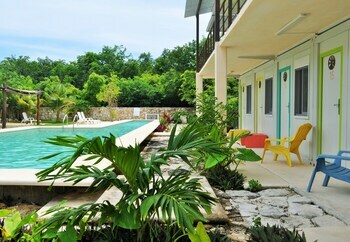 Located in Tulum, Gaia Tulum is within a 15-minute drive of Cenote Crystal and Gran Cenote. Featured amenities include multilingual staff, luggage storage, and a safe deposit box at the front desk. A roundtrip airport shuttle is provided for a surcharge (available 24 hours), and free self parking is available onsite. Located in Puerto Penasco, this vacation home is a 2-minute drive from La Madre Square and 10 minutes from Old Port.